Announcing the New Kane Kennel Feeder | Kane Manufacturing Company, Inc. 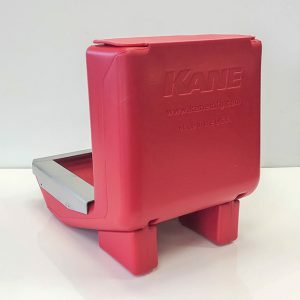 The Kane Kennel Feeder (KKF-18) is built of lightweight, durable, high-density polyethylene. 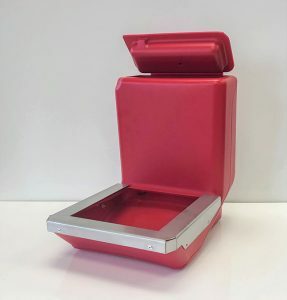 It holds about 5 pounds and has an attached lid, to help keep food dry and clean. The lid features a live hinge and snaps shut for a tight fit. An extended trough, with a stainless steel guard, allows the feeder to be placed outside the kennel. Overall dimensions are: 11” High; 9”Wide; 13” Deep. The trough dimensions are: 9” by 9”. The Kane Kennel Feeder (KKF-18) is built Kane tough and Made in the USA. It will be available for sale starting May 2019. More About Kane Kennel Feeder!